When designing a home office, many people try to strike a balance between being homey and professional. 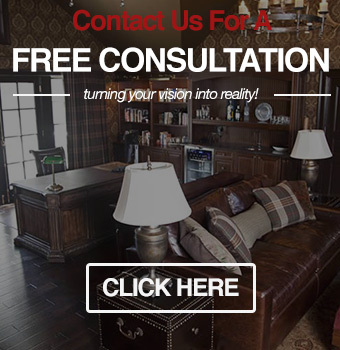 To find the right design for your new home office, we recommend getting in touch with an Oakland County home office remodeler so you can create a space where you can get stuff done. In this blog post, we will go over 5 tips that can help you design the perfect home office for your business. We promise that working in a closet isn’t as oppressive as it sounds. Many people have already transformed unused closets into their own private workspaces. An experienced custom closet builder can help you design a home office with a built-in desk and shelf space. The best part about a home office in a closet is that you can close the doors to your custom closet when you’re finished working. Taking advantage of closet space also helps free up the space you would have otherwise used for your home office. If you don’t have to meet with clients in your home office, a closet office may be the way to go. When you run your business from home, it can be hard trying to stay organized. 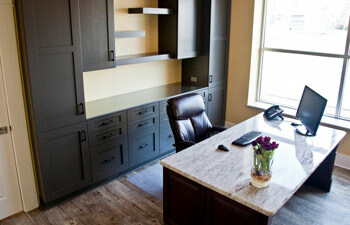 To help declutter your workspace, we recommend hiring a home office remodel contractor to build custom cabinets. Custom cabinets can be a great solution for office supplies so you can keep your desk clear for the really important stuff. Wall-mounted cabinets are also great because they don’t take up floor space like filing cabinets. While working from home, you’ll be able to add more personal touches to your home office space than you might have been able to put in a cubicle. For example, some people like to put treasured souvenirs from vacations on their desks to help them think positively while working. Unlike working in a corporate office, you won’t have to worry about people swiping your stuff. Did you know that plants have been proven to increase productivity? If you don’t have a green thumb, don’t worry. You still get the same benefits from a plastic plant that you would from a live one. A pop of unexpected color can also liven up your desk landscape so it’s not comprised of just documents and a glowing computer screen. In order to work productively, you’ll need to work in a space with proper lighting. This might mean putting a floor lamp near your work space or situating your desk by a spacious window. The idea is to make sure you have enough light to be able to see properly. There are also many different home designs for table lamps if you’d like to put a lamp on your desk. If you are interested in our home office design services, please feel free to call our Oakland County design showroom at (248) 850-7178. The home office design team at Visionary Cabinetry & Design help homeowners organize their space with custom-made cabinets.